So I’m sure everyone has seen this bad boy but I thought I would post it on my blog with the specs and all. After sending out cryptic invitations predictions flooded from media and consumers alike- most thought maybe Windows Phone 8, while other rumors included a potential Xbox Surface, but nope the Microsoft Surface Tablet was unveiled. 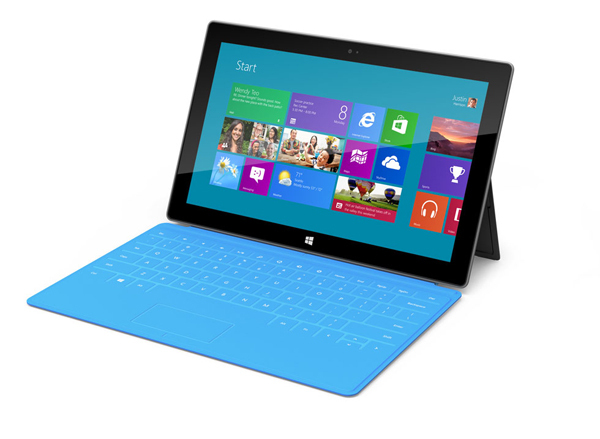 The Microsoft Surface tablet comes in two different options, Windows RT and Windows 8 Pro. Windows 8 Pro, is the obvious pro option, and is said to be the “full PC.” It comes with a heftier weight. This awesome new machinery comes with a sturdy, integrated kickstand and a SmartCover-esque cover, that features a fully functioning keyboard, with a trackpad. It connects with a “single magnetic click”. Tight right? “I can touch type on this as fast as I can type on any keyboard.” said Microsoft’s Michael Angiulo. The Touch Cover comes in five colors – black, red, blue, and pink. The surface also comes with two cameras called “LifeCams” The rear-facing camera is angled so when positioned on a kickstand, it can still record meetings or any other event thats going on. To top everything off, being that this is a full-on PC it can run true PC games. Microsoft has stated the tablet-PC hybrids will be priced competitively, but no mention of price or release date was mentioned. So I guess will just be waiting to see what they got to unveil about it next!